Moscow has revealed additional details about its new 6th generation combat aircraft. Russia has been testing various hardware elements designed for a future 6th generation fighter jet on a 5th generation prototype currently undergoing flight trials, TASS news agency reveals. 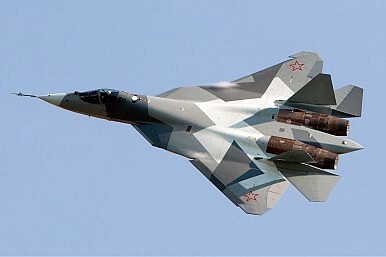 According to Vladimir Mikheyev, advisor to the First Deputy Director General of Concern Radio-Electronic Technologies, a subsidiary of Russian Technologies State Corporation (Rostec), various components of the new jet have been tested on the Sukhoi PAK FA (Prospective Airborne Complex of Frontline Aviation) T-50 prototype. “Standalone solutions that will be applied in the sixth-generation fighter are now being tested on the fifth-generation jet as well as on the ground-based equipment. Separate elements of the flight and navigation system have already been installed on PAK FA,” Mikheyev told TASS news agency on July 11. The PAK FA — the name will change for the production aircraft — is a 5th generation multi-role, single seat, twin-engine air superiority/deep air support fighter slated to enter service with the Russian Air and Space Forces in 2018. It also serves as the prototype for the joint Indo-Russian Sukhoi/HAL Fifth Generation Fighter Aircraft (FGFA) project, or the Perspective Multi-role Fighter (PMF) as it is known in India. In March, Russia revealed for the first time the design of a new 6th generation fighter aircraft (See: “Russia Reveals First Design of New 6th Generation Fighter”). Russian officials remained coy on specific characteristics of the new warplane but noted that it would be available in an manned and unmanned version. The PAK FA radar station should operate both as a locator and reconnaissance system, and the electronic warfare system for its part should engage in radio detection and location. That is, integration and redistribution of functions on the PAK FA is already happening. As I reported previously, in July 2014, the head of the department for military aviation programs at the United Aircraft Corporation, the majority owner of Sukhoi’s design bureau said that the first sixth-generation aircraft could take flight in the second half of the 2020s. Our mission is to lay the foundation for the creation of a sixth generation fighter. Several projects are under consideration. They focus primarily on materials and engines. An interesting project to create unique performance engines in cooperation with the consulting firm Lioulka is under consideration. So far, the eight prototypes of the PAK FA have been undergoing flight trials with the Russian Air and Space Forces. According to Sukhoi, around 700 test flights have taken place to date. However, Russia’s defense industry is still facing technical (as well as financial) hurdles including designing a new engine for the aircraft, given that PAK FA prototypes are currently using engines also installed on Sukhoi Su-35S 4++ generation multi-role fighter jets, calling into question whether the PAK FA can genuinely be classified as an 5th generation aircraft. Russia is purportedly developing a new fighter aircraft in both manned and unmanned versions.